How are we nearly at the end of January already?! Considering it is a long month for everyone waiting for that first pay packet after Christmas it seems to be going exceptionally fast. So as we are almost into February it's time to bring out the hearts in preparation for Valentine's Day. Valentine's Day is a very memorable day for me as it is the day that I got engaged, on top of the Empire State Building. Ten years and three children later while its still a special day, how we celebrate it has changed. It's no longer centered around us as a couple but now us as a family. So while we show love as a family all year round it's fun to celebrate Valentine's Day also. In the run up to Valentine's Day, heart cookie cutters are an essential item to have. In one quick instance you can add some heart shaped food to your children's meals and who knows it might even entice them to eat that piece of cucumber they have been refusing? It may well be January and the middle of winter but that doesn't stop us from enjoying frozen treats. Yogurt bark is something that I've not actually tried and when Sam from Oogaa Baby asked to make a recipe that you've never tried before then I knew this was the one for me. If you follow me on Instagram then you will know that I absolutely love Oogaa products. They are silicone products that contain no nasty toxic elements but are hard-wearing and robust that are perfect for feeding babies and children. You can bake, freeze, microwave and dishwash Oogaa products which make them my go too product. So when deciding on what to make for my Oogaa challenge I always take into consideration the time factor. I don't cope well with long and complicated recipes as I just don't have the time or the willpower. I've previously baked in my Oogaa bowl but this time I decided to freeze it. Oogaa products are freezer safe to -40 degrees Celsius. I followed a recipe from Pinterest which was very easy to adapt to our Oogaa flat plate. 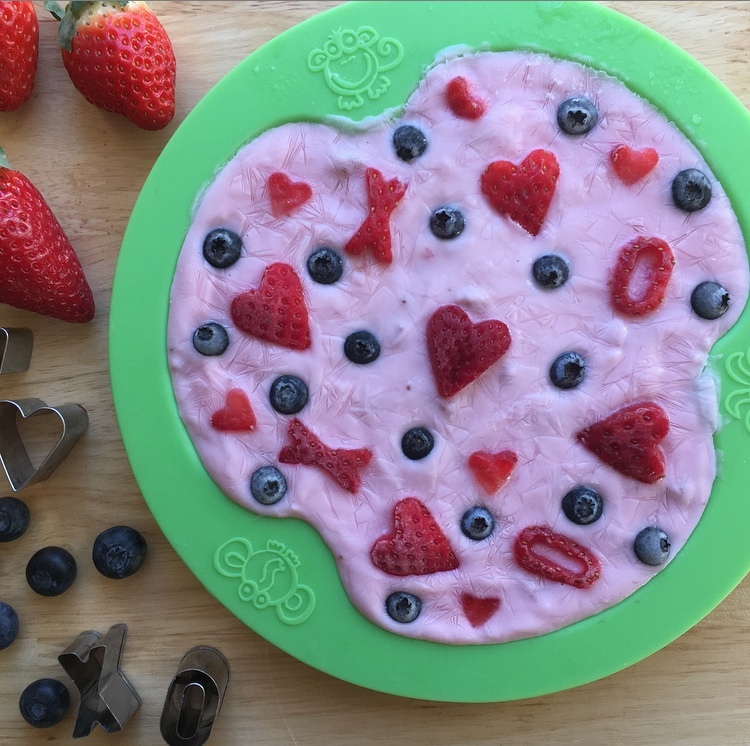 Using a heart cookie cutter cut out hearts from strawberries. I also added some XO from strawberries using alphabet cutters. 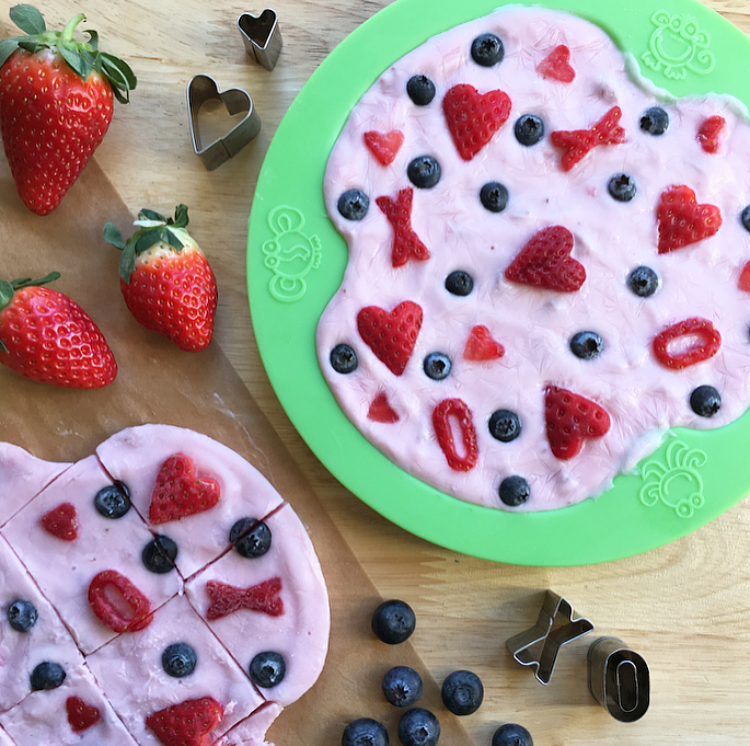 Using the leftover strawberries blend together with 2 or 3 spoonfuls of yogurt. Once blended then pour onto Oogaa plate. Add hearts and blueberries. Place in the freezer for 3 to 4 hours. 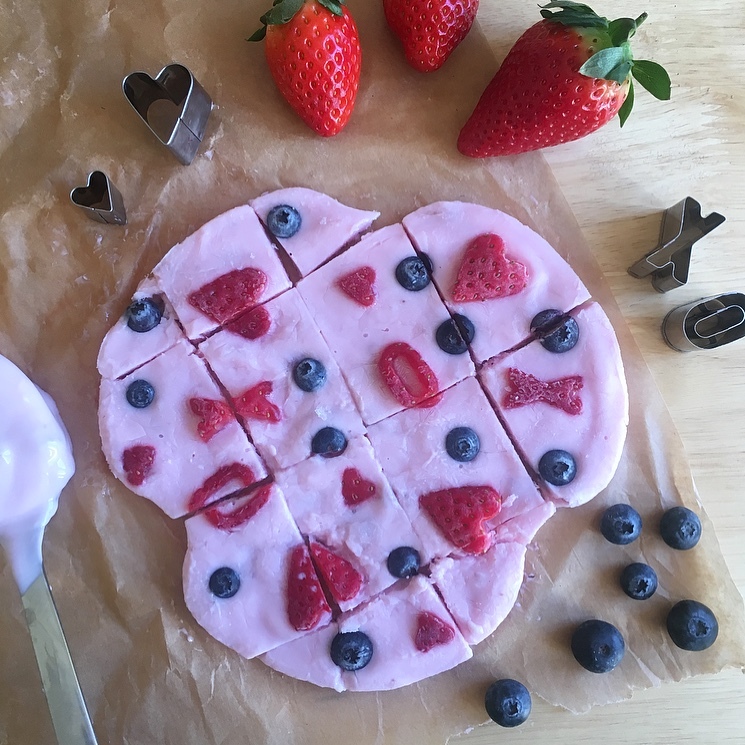 When using the Oogaa plate the yogurt bark pops straight out. Cut into pieces and serve. When serving to young children please be wary as frozen fruit can be a choking hazard.